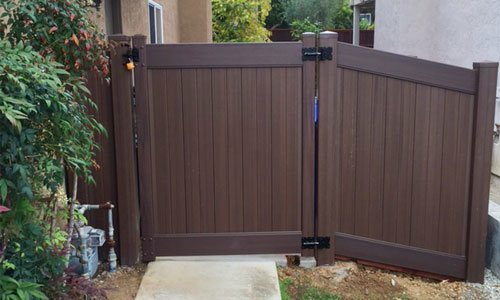 Locally and family-owned Shurlock Fence Company has been serving the fencing needs of San Diego County residents and businesses since 1970. 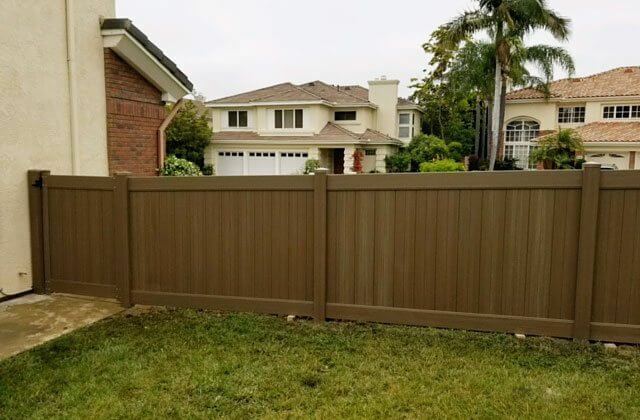 As a licensed and insured fence contractor with decades of experience, we are fully qualified to install and repair nearly any type of wood, vinyl, chain link, or iron fence or gate. Our focus has always been on giving our customers maximum value by offering quality materials and superior craftsmanship at an affordable price. As testament to this, we have thousands of satisfied clients across Escondido, San Marcos, Encinitas, Vista, Rancho Santa Fe, Rancho Bernardo, Poway, San Diego, and surrounding areas, and receive approximately 75% of our business from returning clients and customer referrals. Shurlock Fence Company specializes in custom fence installation. We’re able to design and construct perimeter fencing, security fencing, privacy fencing, driveway gates, or walkway gates to meet nearly any need or application. 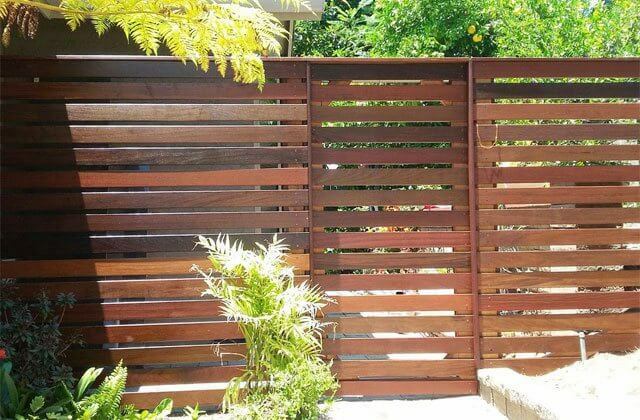 Our wood and vinyl fences come in a diverse range of picket, ranch rail, and solid-board styles. 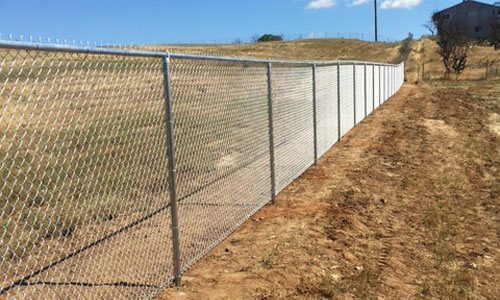 We offer both galvanized chain link and vinyl-coated chain link for fences, gates, tennis courts, backstops, trash enclosures, security cages, dog runs, and more. Additionally, we can install wrought iron or steel fences, gates, and handrails with or without your choice of decorative accents, such as scrolls, knuckles, and circles. We also excel at building a wide range of specialty fences, such as split rail fences, barbed or razor wire fences, horizontal slat fences, exotic wood fences, and more. Whether you are looking to have a few fence panels replaced or need thousands of linear feet of fencing installed around a multi-acre estate, we can help. We welcome fence projects of all sizes and always do everything we can to help you get exceptional results at a great price. We will build your fence or gate according to the industry’s leading practices and in accordance with all relevant building codes. For maximum quality control, all jobs are supervised by the owner, who himself has over 40 years of experience. He treats every fencing project as if it were being installed or repaired for himself. This means that all work is done in a timely manner and every aspect of the fence -- down to the quality of each board -- must meet his own high expectations. We don’t jump around from job to job; instead, we stay on each project until is complete which ensures that properties aren’t left open or cluttered with construction materials any longer than absolutely necessary. 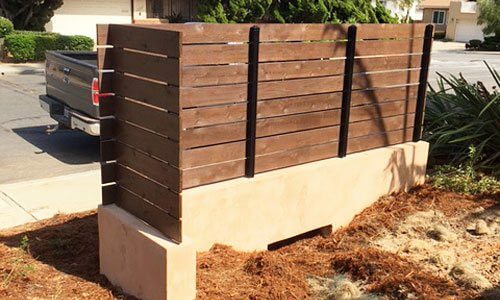 Give us a call at Shurlock Fence Company to allow us to serve your commercial or residential fencing needs in San Diego County. Feel free to browse our website to learn more about the fencing materials, applications, styles and gate options we offer, or give us a call to schedule a free on-site consultation and estimate. We stand behind the quality of our work with excellent warranties. We built this custom free-standing trellis patio cover in Del Mar, CA. 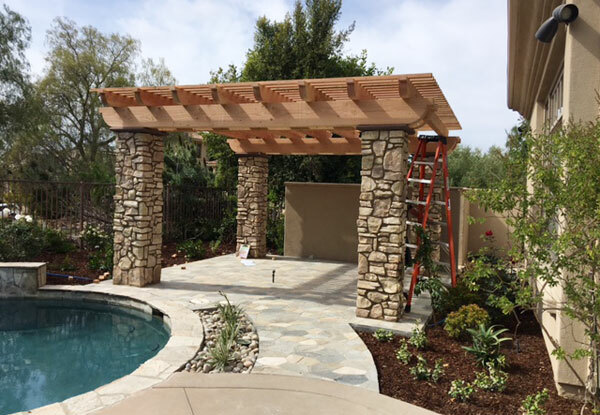 This custom trellis was built on top of large rock pillars for bold and impressive look.